Notre Dame’s Katie Dettwiller scored 21 points and added 16 rebounds in Monday’s 58-35 win over Oak Hill. Notre Dame’s Ava Hassel scored 11 points in Monday’s 58-35 win over Oak Hill. PORTSMOUTH — Notre Dame’s girls haven’t just beaten their opponents this season, they’ve buried them. The Titans, who are the AP’s No. 8 ranked team in Division IV, have won their 16 games by an average margin of 31.8 points this season. That’s after their latest victory, a 58-35 decision over Oak Hill Monday evening in non-conference action. Monday’s win followed the same formula as the previous 15 — jump on the opponent early, knock down open shots, play superb defense, and shift into cruise control. 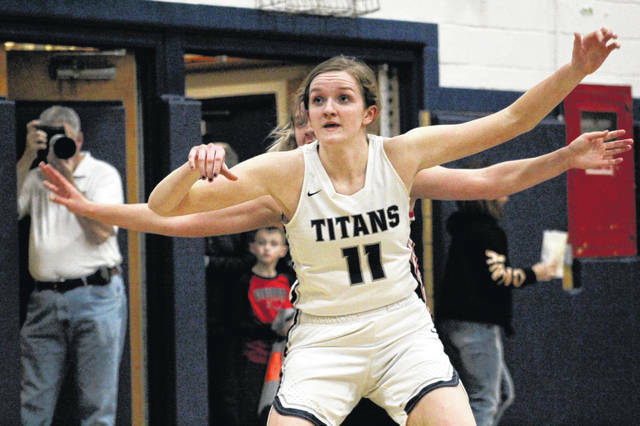 While the Titans (16-0) handed the Oaks (15-4) just their fourth loss this season, Dettwiller did what she usually does, scoring a game-high 21 points and adding 16 rebounds for good measure. In total, Notre Dame won the rebounding battle by a 29-12 margin. Ava Hassel fits Dettwiller’s guard description. The sophomore standout scored 11 points alongside four rebounds and three assists in the win. That performance was coupled with a 13-point outing from Isabel Cassidy who is, for now, taking the place of injured guard Taylor Schmidt. As usual, Hassel gave a tremendous boost to Notre Dame’s defense which, as a unit, held the Oaks to 14-of-43 shooting while causing 18 turnovers. Oak Hill’s most dynamic scorer, Caitlyn Brisker, was held to a frustrating nine points on the night. From the get go, Notre Dame looked like a fine-tuned machine. With 7:45 left in the first quarter, Dettwiller got the scoring started before Cassidy hit a 3, followed by Hassel’s first bucket, making it 7-0 at the 6:07 mark and forcing Oak Hill to take a timeout. By the 3:16 mark, the Titans had a 13-1 lead and continued to keep their feet on the gas pedal. The Oaks got their first field goal to fall at the 2:55 mark before heading into the second trailing 17-6. In the second, Notre Dame really poured it on. Cassie Schaefer made it 24-8 with a 3-ball before Dettwiller scored while being fouled, converting a 3-point play and making it 31-8 with 3:24 left in the first half. By halftime, the Titans had a 41-15 advantage and never looked back. Dettwiller led all scorers with 21 points alongside 16 rebounds while Cassidy followed with 13 points. Hassel ended the night with 11 points, four rebounds and three assists, Clara Hash added in six points and four assists, and Schaefer finished with five points. Oak Hill was led by Brisker, Olivia Clarkson and Payton Crabtree, who all scored nine points. Clarkson added five rebounds to the Oaks’ totals while Brooke Howard passed out six assists. Notre Dame will be back in action Thursday, traveling to East. The Titans will then get ready for Saturday’s showdown with Waynesville at Ironton High School. The Spartans are currently 14-0. Oak Hill: 14-43 FG, 5-9 FT, 2-9 3pt. (Miller 1, Clarkson 1), 12 rebounds (Clarkson 5), 18 turnovers, 9 assists (Howard 6). Scoring: Brisker 9, Crabtree 9, Clarkson 9, Chambers 4, Miller 3, Howard 1. Notre Dame: 22-40 FG, 9-12 FT, 5-9 3pt. (Cassidy 3), 29 rebounds (Dettwiller 16), 20 turnovers, 14 assists (Hash 4). Scoring: Dettwiller 21, Cassidy 13, Hassel 11, Hash 6, Schaefer 5, Smith 2.
https://www.portsmouth-dailytimes.com/wp-content/uploads/sites/28/2019/01/web1_Dettwiller.jpgNotre Dame’s Katie Dettwiller scored 21 points and added 16 rebounds in Monday’s 58-35 win over Oak Hill. 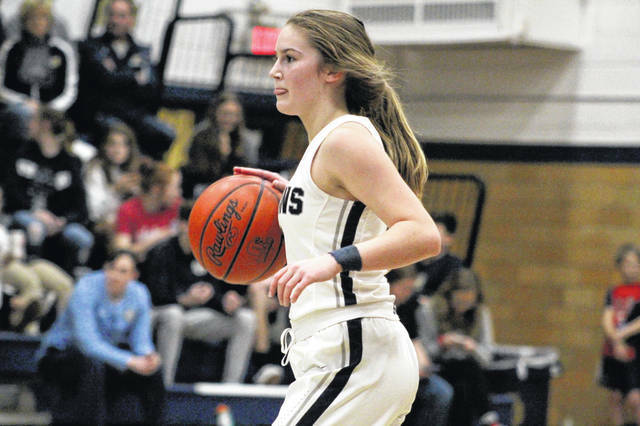 https://www.portsmouth-dailytimes.com/wp-content/uploads/sites/28/2019/01/web1_Hassel-6.jpgNotre Dame’s Ava Hassel scored 11 points in Monday’s 58-35 win over Oak Hill.